Green Beans are the unripe fruit of various cultivars of the common bean (Phaseolus Vulgaris) and are almost universal in their distribution. In Mexico the Green Bean is called Ejotes and in France, Haricot Vert. Green beans are picked before the seeds mature and the shell becomes hard. Green beans are found in two major categories, bush beans and pole beans. There are over 130 known varieties of beans. More detail about different varieties can be read here. Bean colors include green, purple, yellow and speckled red and the growing season is July, August and September. Beans have been part of our diet for so long that they have worked their way into common expressions like "full of beans" and "spill the beans." Click here to learn about Green Beans and here for more fun facts about Green Beans. Store fresh Green Beans in the refrigerator (unwashed!) in an airtight container for up to 5 days. Damp green beans can mold quickly. It is easy to freeze Green Beans. Click here for freezing instructions. 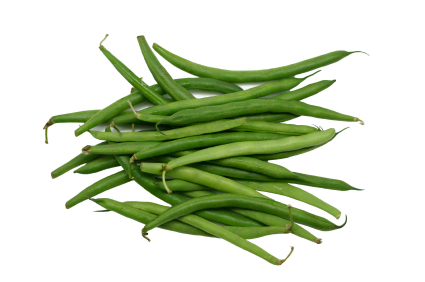 The Green Beans rich green color signifies large amounts of Cartenoids. The Green Beans anti-oxidant capacity is proven to be an anti-inflammatory with diabetes prevention benefits. Green beans are high in Vitamin K, C & B2 as well as Manganese, Fiber and Folate. Click here to learn more about the health benefits of Green Beans. From the refrigerator, thoroughly wash green beans. In preparation for cooking, cut off the tips of the beans. Green beans can be cooked whole or cut into strips. Cut straight across or at an angle. For a French cut, cut the bean lengthwise into two inch pieces. Green beans can be prepared with almost all cooking methods imaginable, from boiling and steaming, to sautéing, baking and roasting. If you are wondering what to do with an over abundance of Green Beans, try pickling!